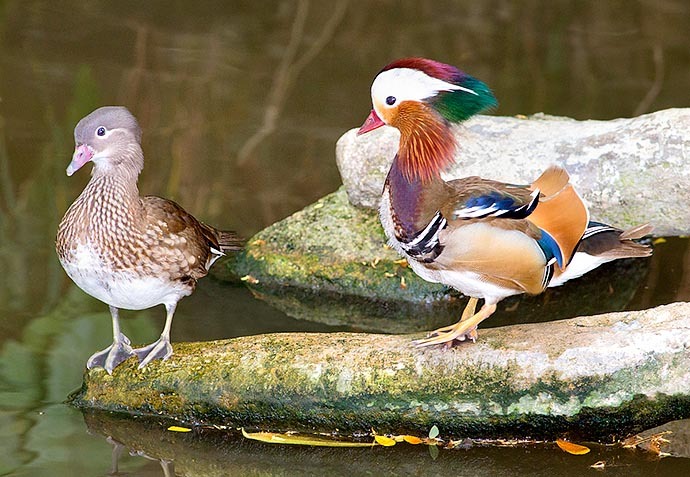 The multicoloured Mandarin duck (Aix galericulata Linnaeus, 1758) is one of the most famous ducks thanks to its elegant beauty; held in high esteem by the Chinese people where it has influenced the art and the culture over the centuries. It belongs to the order of the Anseriforms (Anseriformes), to the family of the Anatids (Anatidae), to the genus Aix and to the species Aix galericulata. The name of the genus “aix” is a Greek name mentioned by Aristotle referring to a bird, and means “small goose, grebe, duck” even if the term is still now undefined. 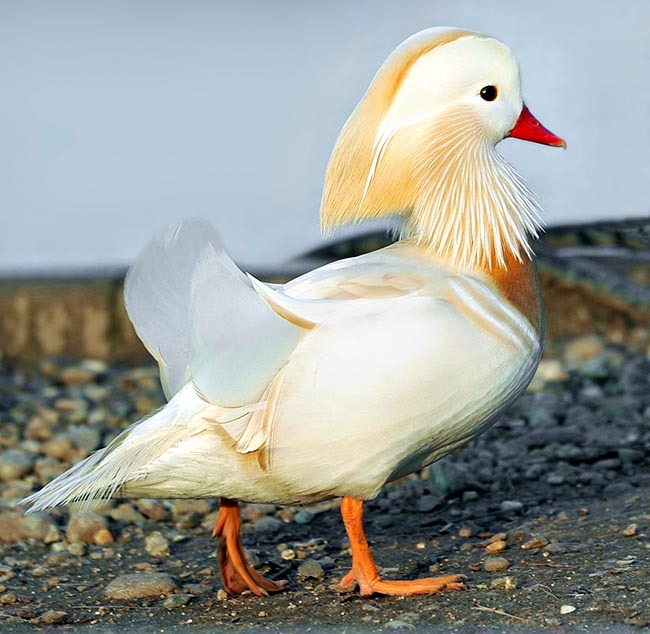 The term indicating the species “galericulata” comes from the Latin “galerculum” and means “wig, fake hat, hood” in reference to the flowing tuft and the long feathers of the cheeks of the males of this species which, together, form a structure rightly recalling a hood or a sort of a helmet. 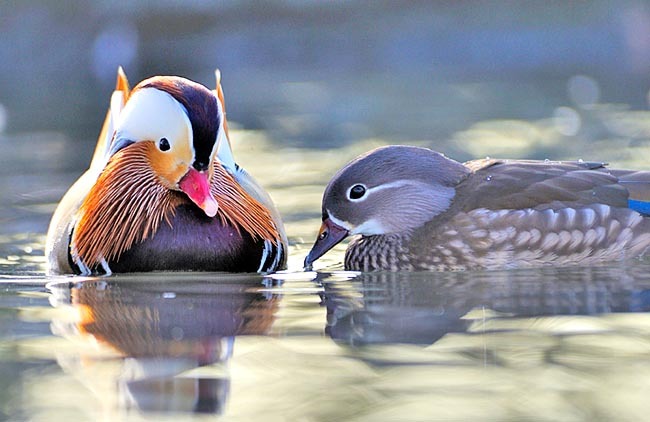 In the past, the Mandarin duck was amply diffused in China, Russia and Japan, but during the last 200 years has suffered from a drastic reduction due to the destruction of the habitats where it lived, the hunting and the captures it has suffered. In the European countries, the species has been introduced due to accidental or voluntary escapes growing wild in various countries: Belgium, Germany, Switzerland, Austria, North Sea area and Great Britain where the extra Asian population is more numerous. Small isolated populations, grown wild, are present also in the USA. The species frequents valleys up to 1500 m of altitude displaying preference for small islands, water streams supporting abundant emergent vegetation and for woods having small lakes inside them. In autumn and winter, the mandarin ducks are more attracted by swamps or more open rivers and by the rice field. Even if more rarely, they can frequent also estuaries or brackish lagoons. It is a small and compact 41-49 cm long duck, with an average weight of 440-570 g and 65-75 cm of wingspan. Simply known under the term of “mandarin”, the males have a splendid livery rendered even more evident by the known and unusual lateral “sails” of orange-brick colour (with whitish upper small border) extending vertically. Such structure originates from a remarkable expansion of the inner portion of the twelfth remex. This quite characteristic expansion has rightly the shape recalling a sail, with a dorsal curve and tip bent cranially. The expanded feathers are observed when the duck is settled and cannot be appreciated when it is flying because they are held flattened against the body. The males of the mandarin duck are very different from the equally but differently multicoloured males of the only other species belonging to the same genus: the Wood duck (Aix sponsa). The nuptial plumage of the male (this species does the eclipse moult) is lively multicoloured; it is range at the level of the head and cheeks. On the sides of the head and of the neck, the feathers form a wide ruff enlarged on the sides where the voluminous arrange feathers present some slightly paler pointed central small lines forming a characteristic drawing like a “shower of fireworks falling sparks”. The head has the vertex starting from the dorsal junction of the bill with iridescent green feathers, goes on with blue feathers, from mid-head continues with orange-brick red feathers and end with an abundant rear green-bluish tuft which, along with the orange cheek feathers, forms a sort of multicoloured erectile voluminous hood. In the dorsal-lateral part of the head, from the level of the eye “upward”, there is an ample white belt, starting shaded of pale orange close to the eye, going on arcuately along the neck laterally and reduces, proceeding back, in a thin stripe doubling in two parallel stripes especially when the tuft is erect. Also the dorsal coverts are green and blue-brown. There is a multiple stripe placed at the base of the orange “sails” that is white-black and blue (with a blue part more visible when the “sails” are set), always the “sails” are bordered on the back of black and in front, for a tract starting from the base, of black and white (with the black adherent to the orange of the sail). The chest has blue-violet changing colouration and laterally continues with two white transversal lines followed by two ampler ones also transversal but black. The sides are beige-orange shaded and vermiculated of pale, the tail is slightly pointed and is green-dark brown dorsally and white laterally-ventrally (undertail). The chest, after the blue-violet part, continues with a candid white part which starts pointed dividing partially rightly the blue-violet part and continuing for the entire abdomen up to the undertail. The wing is blackish brown with changing greenish speculum and white border at the rear of the same. The underwing is dark, dark brown, rather uniform. The bill, fairly small, is bright red with fleshy coloured nail. The legs are orange. The eye has dark brown iris. When flying, the voluminous crest-tuft shaped like a helmet, is carried adherent to the neck. The female has a grey-brown livery, with a white spot under the throat and a thin line, always white, encompassing the eye. A transversal white line can be present close to the base of the bill. The chest and the sides have a white-cream spotting, the abdomen is white, the wings are darker, the bill is greyish with reddish-dark base and the legs are grey with yellowish shades. The females of the two related species, at a first superficial look, are similar to each other. The mandarin females are however paler overall, have more greenish specula (instead of blue-violet), proportionally have slightly bigger and sweeter eyes, without the yellowish colouration on the palpebral rima, the white surrounding the eye is limited to a thin ring continuing towards the nape with a thin white line. The eclipse plumage of the male is similar to the female’s one. This duck is more active during the hours preceding the dawn and by dusk, whilst spends most of the day idling between the vegetation of the banks or perched on branches or on trunks emerging from the waters. Even if in continental Asia the mandarin duck has shy and timid behaviours, it adapts to the human presence when not disturbed. The diet is formed mainly by plants and seeds and is integrated with snails, insects, frogs and small fishes; during the winter period is more vegetarian. In this species, the courting is highly synchronized and the pairs are more disposed to preen each other than their American “cousin”. The courting takes place usually during the period of maximum daily activity (early morning-sunset) when the light is poor or during the day but in locations sheltered by the vegetation, probably for not attracting too much the attention of potential predators. During the courting, the male moves struttingly, with expanded chest, carries the head back on its back with feathers of the head erect, the lateral tufts of the face extended laterally and the feathers of the “sails” well deployed. While the females take care of the eggs incubation, the males may have promiscuous behaviours accompanying themselves with eventual other females. The par bonds are usually loosened during the hatching even if some pairs can remain united also later on. Both species belonging to the genus Aix love nesting n overhead hollows of trees at heights which may reach the 15 metres. The nests may be however placed in fallen tree stumps, roots or trunks and rarely on the ground under bushes or trunks and twigs. The birdhouses, nest boxes, are well accepted and utilized by this species as well as by the American “cousin”. The spawning happens in spring and the clutch is formed usually by 9-15 translucent eggs of cream-beige colour. This species, like the American cousin, can practice the intraspecific parasitism. Some females, in fact, lay their eggs in the nest of other females; these nests may arrive to contain even some tens of eggs. The hatching lasts about 30-33 days and the young follow the mother jumping from the nest trying to glide extending to the maximum the body and the small webbed paws. The ducklings of mandarin duck have colouration similar to that of the ducklings of mallard (Anas platyrhynchos) but differ from these as well as from the similar ducklings of the Wood duck (Aix sponsa) as they have less dark brown and more brown-cinnamon shades and for having the eyes, proportionally, rather big. The young are similar to the females and reach the independence when about 45-60 days old. The males emit vocalizations being not too strong whistling; the females, conversely, can emit moaning and repeated vocalizations, sounds similar to clucking or stronger calls, sharp and acute recalling the vocalizations of the Coots (Fulica atra). The mandarin duck has been imported in England from China, before 1745, and has here, more recently, settled and established due to releases and escapes from the captivity. The naturalized population of English mandarin ducks initially occupied the south-eastern part of England but has expanded remarkably during the last decades. In some zones of England, the species survives only if it receives an artificial alimentary integration; moreover, the species must compete with the Grey squirrels (Sciurus carolinensis) especially for the nesting cavities. In any case, the English population has passed from the about 500 units of 1950 to the about 3000 specimens of 1988 and despite that the introductions of exotic species are not to be favoured, the English population of this duck forms a guarantee for the species seen the strong declines of the Asian populations. 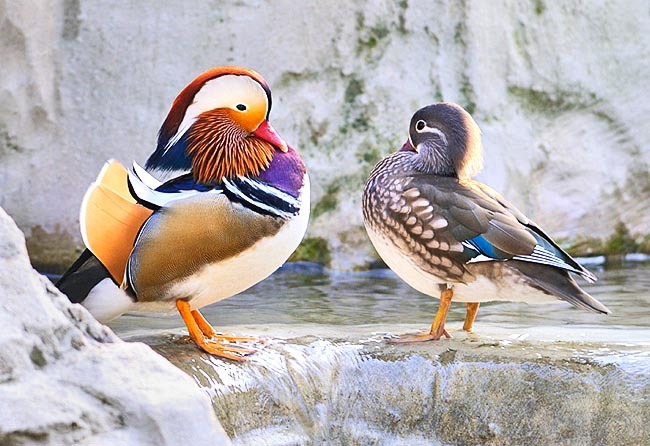 Furthermore, the mandarin ducks, contrary to other exotic species, seem not to compete too negatively with the autochthonous English species. The continental Asian population has migratory habits hibernating, at lower latitudes, in eastern China; all other populations, the Japanese one and the introduced English one in particular, are mostly sedentary. In the past, the mandarin duck was the most numerous duck in wide zones of its range but has drastically reduced, with the contemporaneous serious fragmentation of its habitat, during the last century. The decline of the Russian population has occurred due to the extensive deforestations of the valley forests, because of the navigation of the rivers, the industrial pollution and the irrational hunting done during the reproductive season and the migration of the species. The decline of the Russian population has been in some way contrasted thanks to the reduction of the navigation on the water ways starting from 1980 and thanks to the selective recovery of the forests. 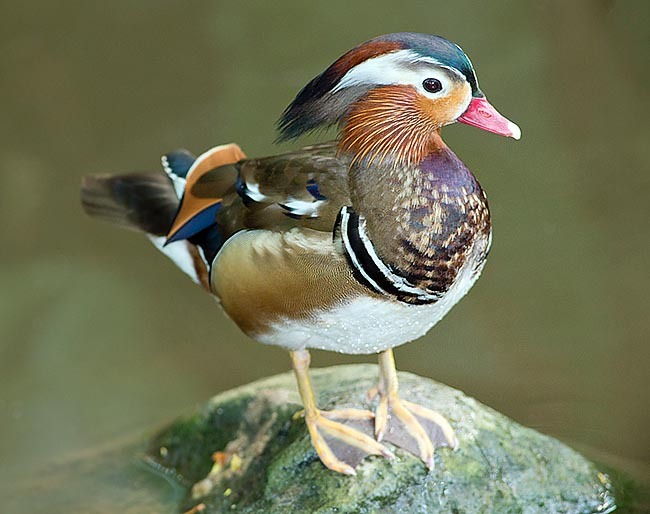 The primary Chinese forests, where the mandarin ducks did reproduce, have been completely destroyed between 1911 and 1928. Such deforestation has not even spared the important imperial hunting lands of the Tung Ling forest. An incalculable number of mandarin ducks have been seized and exported; the massive winter seizures may have been an important factor of decline of the species even if the Chinese government has forbidden the export already from 1975. The Asian population of this species was estimated in 1992 to amount to about 70.000 specimens; 15.000 of these did reside in China, 5.000 in Russia and Korea and even 50.000 specimens in Japan. 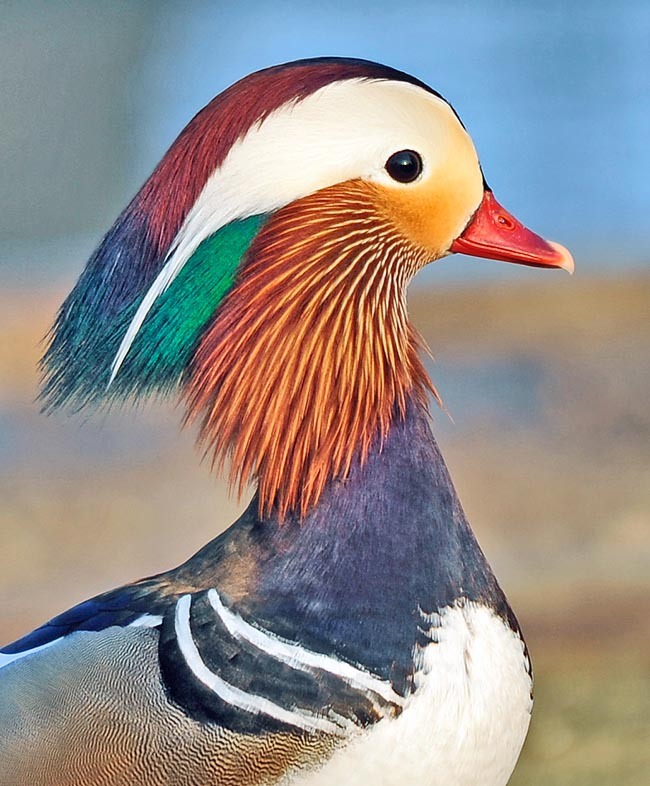 In Japan, the mandarin ducks had been decimated by the excessive hunting but the species has then responded to the following protection implemented from 1947. More recent observations, lead to think that the Chinese winter population, which gathers in southern China, is presumably of around the 30.000 specimens. Anyway, all non recent data concerning the presence of this species are probably overestimated and should be updated. 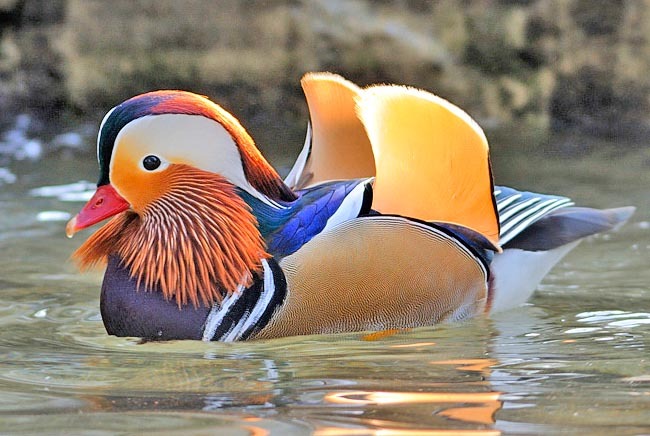 The splendid mandarin duck is one of the aquatic birds most diffused and bred in the amateurish farms and in the ornamental ponds of the whole world. In captivity, they have obtained and go on in obtaining, subjects with mutated colourations which never reach the beauty of the specimens having the ancestral livery. This duck may reach the age of about 10 years in the wild and about the double when in captivity.